Senate is Unanimous: Shut Up! 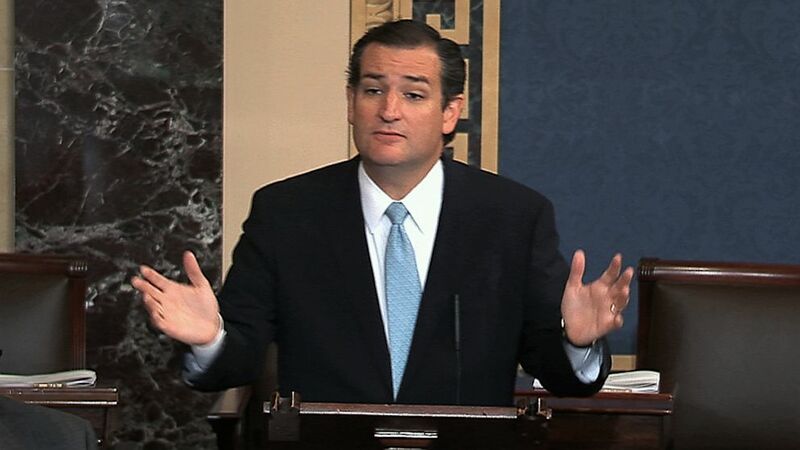 New York Finally, we have found an issue where the entire United States Senate is unanimous: Ted Cruz has to shut up! After wasting more than 21 hours on a Tea Party ego-trip rant about health insurance, Senator Ted Cruz from Texas, where there are 5 million uninsured, even voted, bizarrely, to silence himself. This is progress of as a sort and worth some celebration! WASHINGTON — The Senate on Wednesday moved toward approving legislation to keep the government open without gutting the health care law after Senator Ted Cruz’s 21-hour-and-19-minute verbal assault on it ended with a 100-to-0 vote that is likely to lead to an outcome that Mr. Cruz had tried to stop. The strange series of events started with Mr. Cruz’s marathon speech — which began Tuesday afternoon and went on until noon on Wednesday — and ended with the unanimous vote to cut off debate and proceed to consideration of a bill passed by the House that would keep the government open past Monday. Mr. Cruz’s “yes” vote angered fellow Senate Republicans, baffled Democrats and confused conservative activists who had mobilized to stand with him against any procedural step forward. “A vote for cloture is a vote for Obamacare,” Mr. Cruz said. Yet after the vote on Wednesday, Senator Mike Lee, Republican of Utah, said Mr. Cruz had never intended to oppose the motion to take up the bill, an assertion contradicted by Mr. Cruz’s words and procedural motions for days before the tally. Aides to senior Republican senators fumed that they had been deluged by conservative activists pressing for a “no” vote. While heads spun on Capitol Hill over Mr. Cruz’s performance, Treasury Secretary Jacob J. Lew on Wednesday handed Congress a new deadline to worry about: Oct. 17. That is when the Treasury will have only $30 billion of cash on hand, putting the United States on the precipice of an unprecedented default, unless Congress raises the government’s statutory borrowing limit. It is the first hard deadline offered by the Treasury and compounds the problems of a Congress already struggling to keep the government open past Monday, when much of it will run out of money. “The president remains willing to negotiate over the future direction of fiscal policy, but he will not negotiate over whether the United States will pay its bills for past commitments,” Mr. Lew wrote in a letter to the House speaker, John A. Boehner of Ohio. The Senate has taken up the House bill, which would keep the government open through Dec. 15 while stripping money from President Obama’s Affordable Care Act. Senate leaders in both parties reached agreement to push forward final votes and cut off debate on Friday on the spending bill itself. That would give Mr. Boehner more time to find a path forward in the restive House before the midnight Monday deadline shutting down the government. House Republicans will begin the second stage of the fiscal showdown on Thursday with a meeting to approve legislation to increase the debt ceiling and delay the health care law for a year, force construction of the Keystone XL oil pipeline, and speed up an overhaul of the tax code. Some Senate Republicans urged Mr. Boehner to put a spending bill without policy prescriptions to a vote to keep the government operating — possibly for as little as a week — while negotiations continued. Other Republicans said he should attach only minor changes to the Affordable Care Act, like a repeal of a tax on medical devices that helps pay for the law. Aides to the Republican leadership said Mr. Boehner would make a decision about his next moves only after the Senate completes work on a bill that Democrats hope will finance the government through Nov. 15 without any conservative policy measures. Senate Republicans conceded they were not likely to stop that, and they pressed Mr. Cruz and his allies to relent. “We must all hang together or we most assuredly will all hang separately,” Mr. Cruz said in the 21st hour of his speech, quoting Benjamin Franklin and addressing his fellow Republicans. Just feet away from the Senate chamber, in the ornate Lyndon Baines Johnson Room, Senate Democratic women gathered with mothers and babies to defend the health care law. The biggest vote will be on the spending bill later this week, when Democrats must win over 60 senators to cut off debate on the House measure. If that is achieved, a simple 51-vote majority will be needed on the Democratic version, which leaves the health care law alone. If they succeed, Mr. Boehner may have a matter of just hours to decide whether to let the House vote on the Senate’s spending bill over the strenuous opposition of conservative activists, or to add Republican policy provisions to the bill and send it back to the Senate, a move sure to shutter the government. But those divisions were far from healed. Senator John McCain, Republican of Arizona, followed Mr. Cruz to the floor with a blistering speech, saying the health care law had been subject to months of debate in committee and on the floor, had been amended repeatedly, and was an issue in the 2012 presidential election. He was especially incensed by Mr. Cruz’s comparison of Republicans who are not standing with him to appeasers who allowed Hitler to march through Europe. Annie Lowrey, Ashley Parker and Jeremy W. Peters contributed reporting. This entry was posted in DC Politics, Health Care and tagged Affordable Care Act (ACA), obamacare, Senator Ted Cruz by Wade. Bookmark the permalink.